Caulerpa taxifolia is a light green macroalga with upright leaf-like fronds arising from creeping stolons. 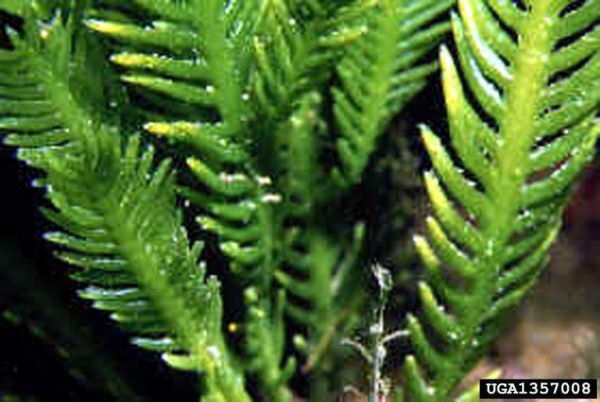 The fronds are flattened laterally and the small side branchlets are constricted at the base (where they attach to the midrib of each frond), are opposite in their attachment to the midrib (as opposed to alternating) and curve upwards and narrow towards the tip. The invasive aquarium clone is morphologically identical to native populations of the species. Frond diameter is 6-8mm and frond length is usually 3-15cm in the shallows, 40-60cm in deeper situations but can grow up to 2.8m in height (NIMPIS, 2002). C. taxifolia is distinguished from other Australian Caulerpa species by the branchlets that are constricted at the base (where they attach to the midrib of each frond) and they are opposite in their attachment to the midrib (as opposed to alternating). Also, the branchlets curve upwards and taper at the apex (NIMPIS, 2002\r\n). The cold-tolerant aquarium (Mediterranean) clone is the invasive strain of this species, and is therefore referred to as Caulerpa taxifolia in this profile. It was introduced to the Mediterranean in wastewater from the Oceanographic Museum at Monaco where it now covers over 13,000 hectares of seabed along 190km of coast. An invasive tropical strain has also been discovered near Sydney, Australia (Nova, 2003) and invasions were also detected in southern California (Williams & Grosholz, 2002). Genetic analysis has revealed that the C. taxifolia strains found in California are identical to those found in the Mediterranean and in many aquaria. They are also very similar to plants found in southern Australia, leading to the hypothesis that the invasive strain originated from Australia and was distributed via the aquarium trade to many parts of the world (Meinesz et. al, 2001b). In the Mediterranean Sea, the molluscs Oxynoe olivacea and Lobiger serradifalci are found on C. taxifolia and feed on it. The grazing rate of these two ascoglossans is low and significantly effected by temperature. Elysia subornata is an opisthobranch that feeds only on species of Caulerpa and is a potential for biological control of C. taxifolia in the Mediterranean. During summer and autumn, the toxic substance produced by C. taxifolia, caulerpenyne, may be the reason there are few consumers (NIMPIS, 2002). Research on the Mediterranean and tropical strains of C. Taxifolia revealed some major differences between them. The Mediterranean strain has larger fronds, lacks female gametes, can withstand lower temperatures, and has increased concentrations of defensive chemical metabolites (Raffaelli et. Al, 1997). C. Taxifolia appears to have been distributed around the Mediterranean as fragments attached to ship anchors, as the locations of new outbreaks are predominantly associated with port and mooring facilities (Meinesz et. Al, 2001b). Observation of native populations of C. Taxifolia growing at temperatures of 9 to 11°C in Moreton Bay, Australia, has raised doubts over whether the Mediterranean populations are of a genetically-modified, cold-adapted strain, as has been asserted by some authors (Phillips & Price, 2002). Monoecious. In the Mediterranean reproduction is vegetative by fragmentation. In native populations, male and females gametes fuse forming a zygote which grows through two little known stages prior to becoming the adult (NIMPIS, 2002). Sexual reproduction has been observed in central Queensland. Gametes released in June - September in Adriatic Sea (NIMPIS, 2002). Widely used as a decorative plant in private and public saltwater aquaria (Meinesz et. al, 2001b). Found on a wide variety of substrates from rock, sand and mud to seagrasses. It is usually found in depths of 3-35m, but has been recorded at depths down to 100m in the Mediterranean. The invasive aquarium strain is able to occupy up to 100% of the available substratum. Native populations in tropical waters are found on rocky reefs and seagrass meadows in sheltered or moderately wave-exposed areas in both polluted and pristine waters (NIMPIS, 2002). The temperature range for the Mediterranean strain is 7°C - 32.5°C, while the maximum salinity is 38 ppt (NIMPIS, 2002). Native populations of C. taxifolia are known to reproduce sexually, however the aquarium strain is apparently an all-male clone (only producing male gametes). 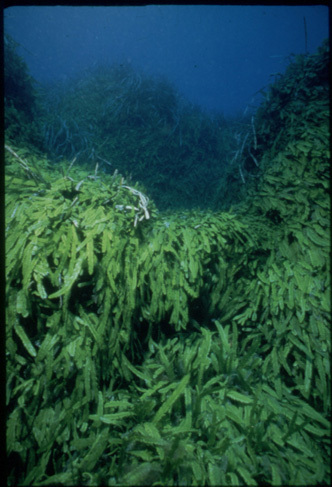 In the Mediterranean the aquarium strain spreads vegetatively by growth of the stolons or by regeneration from broken off fragments as small as 1 square centimetre in size (NIMPIS, 2002). The minimum reproductive temperature has been recorded as 25°C for all-male clones in the Adriatic Sea (NIMPIS, 2002). Caulerpa taxifolia gains nutrition through photosynthesis. 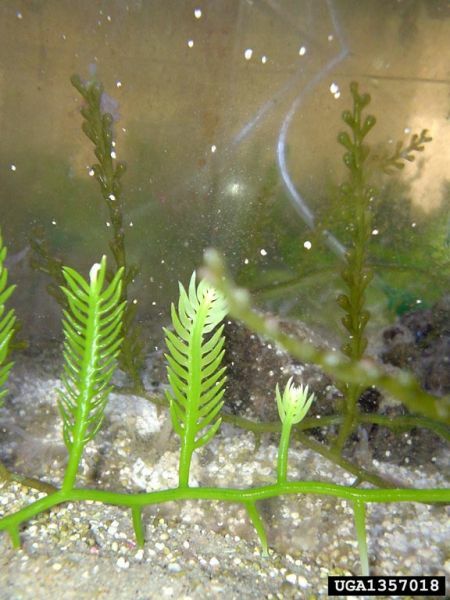 Cuttings can be distributed over long distances by boat anchors or fishing nets.Used as an ornamental species in home and public aquaria.Caulerpa taxifolia has established in a number of locations as the result of improperly disposed waste from aquaria.Cuttings can be distributed over long distances by boat anchors or fishing nets. Principal source: National Introduced Marine Pest Information System (NIMPIS). 2002. CSIRO, Australia. Review: Dra. M� Antonia Ribera, Laboratory of Botany, Faculty of Pharmacy, University of Barcelona, Spain. Recommended citation: Global Invasive Species Database (2019) Species profile: Caulerpa taxifolia. Downloaded from http://www.iucngisd.org/gisd/species.php?sc=115 on 22-04-2019. The Caulerpa taxifolia aquarium strain in the Mediterranean Sea is extremely invasive and smothers other algal species, seagrasses and sessile invertebrate communities. It does this by either out-competing species for food and light or due to the toxic effects of its caulerpenyne compounds. Its large monospecific meadows have vastly reduced native species diversity and fish habitat (NIMPIS, 2002). Effects on humans are mostly related to the reduction of catches for commercial fishermen due to the elimination of fish habitat by C. Taxifolia, although the entangling of nets and boat propellers with this weed also affect efficiency (NIMPIS, 2002). Fish which are able to eat C. Taxifolia, such as the Mediterranena bream (Sarpa salpa), accumulate toxins in their flesh that make them unsuitable for human consumption (Meinesz & Hesse, 1991). 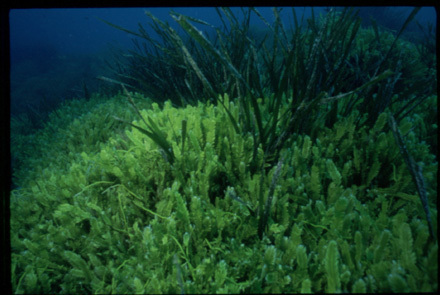 C. Taxifolia outcompetes the seagrasses Posidonia oceanica and Cymodocea nodosa in Mediterranean ecosystems (NIMPIS, 2002). Economic impacts resulting from the cost of eradication included approx $US6 million spent in Southern California up to 2004 (Anderson, 2004) and $AUS6-8 million in South Australia. Preventative measures: Nyberg and Wallentinus (2005) state that Caulerpa taxifolia is one of five top risk species in Europe. The authors study quantitatively ranked species traits which facilitate introduction and predominance using interval arithmetic to search for common patterns among 113 marine macroalgae introduced in Europe. From the abstract Nyberg and Wallentinus (2005) “Three main categories were used: dispersal, establishment and ecological impact. These were further subdivided into more specific categories, a total of 13. Introduced species were compared with the same number of native species randomised from the same families as the introduced. Invasive species (i.e. species having a negative ecological or economical impact) were also compared with non-invasive introductions, separately for the three algal groups. In many categories, as well as when adding all species, the introduced species ranked more hazardous than the native species and the invasive species ranked higher than the non-invasive ones. The ranking within the three main categories differed, reflecting different strategies between the species within the three algal groups. When all categories (excluding salinity and temperature) were summed, the top five risk species, all invasive, were, in descending order, C. fragile spp. tomentosoides, Caulerpa taxifolia, Undaria pinnatifida, Asparagopsis armata and Grateloupia doryphora, while Sargassum muticum ranked eight and Caulerpa racemosa ten. Fifteen of the twenty-six species listed as invasive were among the twenty highest ranked”. Chemical: Colonies of C. taxifolia that were discovered in Southern California were eradicated by covering and sealing them with PVC tarpaulins and injecting liquid chlorine underneath. Subsequent treatments at another location used solid chlorine formulations (Anderson & Keppner, 2001). Costs of the Southern Californian eradication were $US2.33 million from 2000-01 for control and monitoring (Carlton, 2001), with an ongoing annual surveillance cost of $US1.2 million until 2004 (Anderson, 2004). Application of coarse sea salt at a concentration of ~50kg/m² has been used with moderate success in Australia, eradicating C. taxifolia from an area almost 5200 m² in one case, although in another case an area of 3000 m² showed a reduction in algal density but eradication was not achieved. The use of this method in the cooler months, when C. taxifolia naturally dies back, was recommended. Salting has so far only been succesfully used on soft sediments in water <6m in depth (Glasby et. Al, 2004). Physical: Simply covering C. Taxifolia colonies with black PVC plastic was found to be reasonably successful in Croatia. A total area of 512 m² was treated, with either no or sporadic regrowth occurring after treatment (McEnnulty et. Al, 2001). Manual removal by scuba divers was successful in eradicating a small patch of C. Taxifolia, around 3.4 m², in the French Mediterranean. The use of a suction pump to remove all fragments has also met with moderate success in other areas. Clearance rates for manual removal are from <1 m² to ~3 m² per diver per hour (McEnnulty et.al, 2001). Informations on Caulerpa taxifolia has been recorded for the following locations. Click on the name for additional informations. Summary: Rapid response report for Caulerpa taxifolia in California. Anderson, L. W. J. 2004. Eradication of Caulerpa taxifolia in the US five years after discovery: are we there yet? In 13th International Conference on Aquatic Invasive Species, September 20-24, 2004, Ennis, County Clare, Ireland. Summary: An abstract about the eradication of C. taxifolia in Southern California. Anderson, L. W. J., and Keppner, S. 2001. Caulerpa taxifolia: Marine algal invader provokes quick response in U.S. waters. ANS Digest 4(2): 13; 21-23. Summary: Information on the eradication of C. Taxifolia in California. Boudouresque, C. F., Meinesz, A. and Gravez, V. 1994. First International Workshop on Caulerpa taxifolia, Nice, France, 17-18 janvier 1994. GIS Posidonie, Marseille, France. 392pp. Summary: This book includes a synthese of results of the CE- LIFE Program Spreading of the tropical seaweed Caulerpa taxifolia in the Mediterranean and the 46 lectures presented on the First International Workhop on Caulerpa taxifolia. Boudouresque, C. F., Meinesz, A. and Gravez, V. 1998. Scientific papers and documents dealing with the alga Caulerpa taxifolia introduced to the Mediterranean, Ninth edition. GIS Posidonie publishers, Marseille, France: 1-60. Summary: This publication contents the bibliographic references of 358 documents and scientific papers about Caulerpa taxifolia invasion in the Mediterranean Sea. Carlton, J. T. 2001. Introduced species in U.S. coastal waters: environmental impacts and management priorities. Pew Oceans Commission, Arlington, Virginia. Summary: An overview of many introduced marine species in the U.S.
Commonwealth of Australia. 2004. Environment, Communications, Information Technology and the Arts References Committee: report on the regulation, control and management of invasive species and the Environment Protection and Biodiversity Conservation Amendment (Invasive Species) Bill 2002. Summary: A small amount of information on the cost of eradicating C. taxifolia from the West Lakes in Adelaide, South Australia. Coquillard, P., Thibaut, T., Hill, D. R. C., Gueugnot, J., Mazel, C. and Coquillard, Y. 2000. Simulation of the mollusc Ascoglossa Elysia subornata population dynamics: application to the potential biocontrol of Caulerpa taxifolia growth in the Mediterranean Sea. Ecological Modelling 135: 1-16. Summary: Using a public awareness campaign to help detect and halt the spread of Caulerpa taxifolia in Europe. Gacia, E., Rodr�guez-Prieto, C., Delgado, O. and Ballesteros, E. 1996. Seasonal light and temperatura responses of Caulerpa taxifolia from the northwestern Mediterranean. Aquatic Botany: 215-225. Summary: Seasonal light requirements and temperature tolerance of the Mediterranean C. taxifolia were examined by means of photosynthetic assays. These results indicate that this species is well adapted to light abd temperature typical of the infralittoral and upper circalittoral zone in the Mediterranean. Its annual productivity pattern seems less affected by seasonal fluctiations than has beeb reported for endemic seaweeds; this response may explain its potentially high invasive capacity. Glasby, T., Creese, B., Gibson, P. 2004. 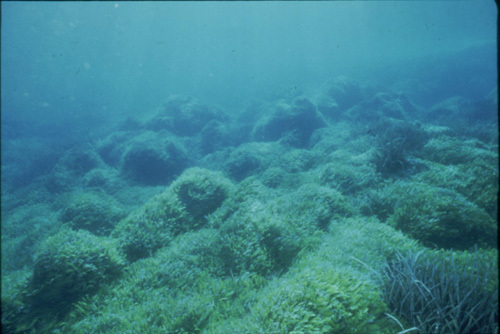 The spread and attempted control of the invasive seaweed, Caulerpa taxifolia, in New South Wales, Australia. In 13th International Conference on Aquatic Invasive Species, September 20-24, 2004, Ennis, County Clare, Ireland. Summary: Information on the use of salting to control C. taxifolia. Glasby, T.M., Creese, R.G., and Gibson, P.T. Experimental use of salt to control the invasive marine alga Caulerpa taxifolia in New South Wales, Australia. Biological Conservation 122(4): 573-580, 2005. Summary: Methods in understanding the spread of Caulerpa along the French Mediterranean coast. Meinesz A., Cottalorda J. M., Chiaverni D., Cassar N and De Vaugelas J. (1998) Suivi de l invasion de l algue tropicale de l algue tropicale Caulerpa taxifolia en Mediterran�e: situation au 31 d�cembre 1997. Lab. Environnement Marin Litoral, Universit� de Nice-Sophia Antipolis publications: 1-238. Summary: Report on the expansion of Caulerpa taxifolia in the Mediterranean coasts at end of 1997: 5 countries affected, 99 stations cited, 4630 ha concerned, 81 km of coast affected. The report included the cartography of the C. taxifolia populations in each station. Summary: Overview of identifcation techniques and a possible framework for the management of future incursions. National Introduced Marine Pest Information System (NIMPIS) 2002. Caulerpa taxifolia species summary. National Introduced Marine Pest Information System (Eds: Hewitt C.L., Martin R.B., Sliwa C., McEnnulty, F.R., Murphy, N.E., Jones T. & Cooper, S.). Summary: Links are provided from the species summary page to more information on Common Names, Synonyms, Identification Notes, Similar Species, Morphology, Reproduction, Life Cycle, Habitat, Survival, Food, Competitors, Predators, Impact information, Vectors, Dispersal, Control options and additional information. Ribera, M. A., Ballesteros, E., Boudouresque, C. F., G�mez, A. and Gravez, V. 1996. Second International Workhop on Caulerpa taxifolia. Barcelona, Spain, 15-17 December 1994. Publicacions Universitat de Barcelona: 1-457. Summary: This book includes a synthese of results of the CE- LIFE Program Spreading of the tropical seaweed Caulerpa taxifolia in the Mediterranean and the 54 lectures presented on the Second International Workhop on Caulerpa taxifolia. Summary: Possible biocontrol has been found for Caulerpa. Thresher, R. E., Kuris, A. M. 2004. Options for managing invasive marine species. Biological Invasions 6: 295-300. Summary: A review of management techniques used for invasive marine species. UNEP. 2004. Caulerpa taxifolia, a growing menace for the temperate marine environment. United Nations Environment Programme. Summary: A good general-information resource on C. taxifolia. Summary: The proceedings include summary papers containing both previously published and unpublished work on a wide range of issues concerning the invasion of Caulerpa and issues concerning similar invasive species and their habitats. The Editors have attempted to put together all the information presented in a way that accurately reflects how this information was presented at the conference. They hope that this information will help guide future eradication efforts in both the U.S. and elsewhere. Williams, S. K., Grosholz, E. D. 2002. Preliminary reports from the Caulerpa taxifolia invasion in southern California. Marine Ecology Progress Series 233: 307-310. Summary: Reports on in situ observations of a C. taxifolia invasion in Huntington Harbour, California. Summary: Experiment into the effectiveness of using chlorine as a way of controlling Caulerpa taxifolia. Summary: Report into the progress of eradication of Caulerpa taxifolia in Southern California. Summary: Up-to-date information on the distribution of C. taxifolia in the Mediterranean and worldwide. Contains a dynamic distribution map of the Mediterranean and is available in both French and English. Boudouresque, C. F., Meinesz, A., Ribera, M. A. and Ballesteros, E. 1995. Spread of the green alga Caulerpa taxifolia (Caulerpales, Chlorophyta) in the Mediterranean: possible consequences of a major ecological event. Scientia Marina 59 (supl.1): 21-29. Summary: This is a synthese of the knowlege on the ecology, biology, toxicity, impacts and management of the Mediterranean populations of Caulerpa taxifolia. And it concludes that if Caulerpa taxifolia continues to spread at present rates we will witness a major ecological event, with a strong decrease of eco-diversity, in the Mediterranean coastal waters. Guerriero, A., Meinesz, A., d Ambrosio, M. and Pietra, F. 1992. Isolation of toxic and potentially toxic sesqui- and monoterpens from the tropical green seaweed Caulerpa taxifolia which has invaded the region of Cap Martin and Monaco. Helvetica Chimica Acta. Summary: The Caulerpa taxifolia of Cap Martin (France) contains the known sesquiterpenic toxins caulerpenyne and oxytoxin. Novel potentially toxic products isolated in small amounts from this seaweed include the sesquiterpenes taxifolial A, taxifolial B, 10,11 epoxycaul. Guiry, M.D. & Nic Dhonncha, E., 2005. Caulerpa taxifolia AlgaeBase version 3.0. World-wide electronic publication, National University of Ireland, Galway. AlgaeBase is available from: http://www.algaebase.org; Caulerpa taxifolia information is available from: http://www.algaebase.org/SpeciesDetail.lasso?species_id=1413&-session=abv3:82D8C9F50cb2503A64PhW2DCE6D3 [Accessed 20 May 2005]. Jousson, O., Pawlowski, J., Zaninetti, L., Meinesz, A. and Boudouresque, C. F. 1998. Molecular evidence for the aquarium origin of the green alga Caulerpa taxifolia introduced to the Mediterranean Sea. Marine Ecology Progress Series 172: 275-280. Summary: The first molecular evidence that the tropical alga C. taxifolia escaped to the sea from a public or private aquarium is referred. These data show that this alga is genetically identical to the strain cultivated in western European aquaria since the early 1970 s.
Kaiser, J. 2000. California algae may be feared european species. Science 289: 222-223. Summary: The first record of C. taxifolia in Californian coasts is reported. Langar, H., Djellouli, A., Ben Mustapha, K. and El Abed, A. 2000. Premi�re signalisation de Caulerpa taxifolia (Vahl) C. Agardh en Tunisie. Bull. Inst. Sci. Tech. Mer 27: 7-8. Summary: The first record of Caulerpa taxifolia on the Tunisian coast is reported. Lem�e, R., Pesando, D., Issanchou, C. and Amade, P. 1997. Microalgae: a model to investigate the ecotoxicity of the green alga Caulerpa taxifolia from the Mediterranean Sea. Marine Environmental Research 44: 13-25. Summary: The inhibition or delay of the proliferation of several phytoplanktonic strains by the action of organic extracts of C. taxifolia is reported. Seasonal variations of the toxicity were observed with a maximal effect in the summer. Meinesz, A. and Hesse, B. 1991. Introduction et invasion de l algue tropicale Caulerpa taxifolia en M�diterran�e nord-occidentale. Oceanologia Acta 14(4): 415-426. Summary: The first record of Caulerpa taxifolia in the Mediterranean coasts is reported and the authors point out that the development characteristics of this population are different from those in its native tropical areas. Meinesz, A., Belsher, T., Thibaut, T., Antolic, B., Mustapha, K. B., Boudouresque, C-F., Chiaverini, D., Cinelli, F., Cottalorda, J-M., Djellouli, A., El Abed, A., Orestano, C., Grau, A. M., Ivesa, L., Jaklin, A., Langar, H., Massuti-Pascual, E., Peirano, A., Tunesi, L., de Vaugelas, J., Zavodnik, N., Zuljevic, A. 2001. The introduced green algae Caulerpa taxifolia continues to spread in the Mediterranean. Biological Invasions 3: 201-210. Summary: A paper looking at the distribution and spread of C. taxifolia in the Mediterranean Sea. Meinesz, A., Hesse, B. 1991. Introduction of the tropical alga Caulerpa taxifolia and its invasion of the northwestern Mediterranean. Oceanologica Acta 14(4): 415-426. Summary: A review of the invasion of the Mediterranean by C. taxifolia. Nova. 2003. Deep Sea Invasion. Summary: Contains the chronology of the C. taxifolia invasion in the Mediterranean and around the world. Available from: http://www.pbs.org/wgbh/nova/algae/ [Accessed on 7 December, 2004]. Phillips, J. A., Price, I. R. 2002. How different is Mediterranean Caulerpa taxifolia (Caulerpales: Chlorophyta) to other populations of the species? Marine Ecology Progress Series 238: 61-71. Summary: Information regarding the distribution of C. taxifolia within Australia. Raffaelli, A., Pucci, S., Pietra, F. 1997. Ionspray tandem mass spectrometry for sensitive, rapid determination of minor toxic sesquiterpenoids in the presence of major analogues of the foreign green seaweed Caulerpa taxifolia, which is invading the Northwestern Mediterranean. Analytical Communications 34: 179-182. Summary: A paper looking at differences between the chemical defences of the tropical and Mediterranean strains of C. taxifolia. Schaffelke, B., Murphy, N., Uthicke, S. 2002. Using genetic techniques to investigate the sources of the invasive alga Caulerpa taxifolia in three new locations in Australia. Marine Pollution Bulletin 44: 204-210. Summary: Has information on C. taxifolia distribution within Australia and the relationship between new occurrences and the invasive strain of this species.